Welding is a process of joining two pieces of metal that has been used for centuries and can be done indoors or out. Advances made in welding equipment and welding techniques have made welding training more essential in recent years. Welding is used in so many different industries and manufacturing processes that it has become a high demand skill with great prospects for future career growth. Welders with experience in more complicated welding processes such as TIG welding will have no problem securing a position. While welding has been around since ancient times, it was not until the early 20th century that modern welding as we know it came into existence. Gas Tungsten arc welding (GTAW) or TIG welding was invented in 1941 by Russell Meredith of the Northrop Aircraft Corporation as a way to weld aluminum and magnesium in order to join light alloys used in aircraft manufacturing. Union Carbide’s Linde division bought the rights to the GTAW welding patent and developed different torch designs under the “Heliarc” brand name. The first Heliarc machines were big transformer-rectifier based and weighed hundreds of pounds. During World War II, TIG welding became the preferred method to weld aircraft parts. In the late 1970’s the Miller Company introduced the “square wave form” which allowed for much better arc control and smaller machines more suitable for AC applications. With the introduction of printed circuit boards and inverter-style TIG machines, the adjustment capabilities and lighter weight gave way to what is now the TIG welding method. The TIG welding process uses an electric torch with a tungsten electrode to deliver the current to the welding arc. A filler rod is hand-fed into the weld puddle, while the torch is held in the other hand. Both are protected and cooled by inert argon gas. Either an accelerator pedal on a bench machine or a fingertip remote on a handheld torch can control the heat while the welder is welding. Make sure your metal surface is well-prepped and clean. Brush any contaminants away from the metal surface and wipe it down with a clean cloth and acetone to remove metal shavings and oils that can interfere with the welding process. Select the correct TIG welding electrode. TIG uses 6 electrodes to transfer the welding arc to the metal pieces that you are working with. Pure tungsten electrodes are affordable and provide a stable arc on aluminum and magnesium using a balled tip. Thoriated electrodes are the most common electrodes because thorium is mixed into the tungsten to make a stronger electrode tip, which will remain sharp and last longer than tungsten. When working with thoriated electrodes, you must have adequate ventilation and safety precautions in place, as it is slightly radioactive. Ceriated electrodes are often used on DC applications with low amperage projects or small, intricate parts. Lanthanated electrodes are very versatile and will work on AC and DC machines. They provide stable arcs and work well on low currents. Ziroconiated electrodes are used on AC projects where you need a strong electrode that’s resistant to contamination. Rare-earth electrodes offer a stable arc for AC and DC projects and have a tendency to last longer. There are three types of shielding gases commonly used in TIG welding. Pure Argon is a frequent go-to gas because it can be used for any type of metal that you are welding and it provides a very effective shield when you weld. When using pure argon gas, the arc is narrow and concentrated so you get a very precise weld. The outer areas of the arc do not overheat while welding. An argon gas mixture of helium and argon will increase the amperage in order to make hotter welds. This mixture will work well for most types of metal except mild steel. The helium conducts heat and creates a wide heat that will reach the edges of a weld puddle. Some welders that frequently work with stainless steel choose to work with an argon gas mixed with 5% or less hydrogen because it increases the heat while welding and creates a wide, hot weld bead that penetrates deep into the metal. TIG welding is a very precise, controlled method of welding that is one of the hardest to learn. The process has a lot of fans but does have some disadvantages. TIG welding gives the most precise, controlled welds possible. TIG welding produces the smoothest finish. You can use TIG welding to weld a variety of different metals including non-ferrous metals such as copper, magnesium and aluminum. TIG welding is a complex method to learn. A great deal of control and accuracy must be maintained in order toe deep the arc the correct distance from the metal work pieces. TIG welding is a slow process. TIG welding creates some safety concerns due to the use of non-consumable electrodes that are not flux-coated and thus don’t screen the arc light well. TIG welding is particularly dangerous due to the exposure to high heat arcs and gases. Beginning welders should be well grounded in the safety protocols and proper welding method before they ever use a TIG welding torch. Here are a few tips to keep in mind when TIG welding. Always wear safety gear to protect your body and face from burns. A wide variety of safety gear is available for welders such as helmets, goggles, gloves, jackets, aprons, sleeves, pants and shoe covers. Work in a well-ventilated area. Fresh air reduces the amount of toxic fumes you are exposed to. Be sure your welding equipment is properly grounded. Improperly grounded equipment can result in electric shock. Keep your work area dry. Moisture increases the risk of electric shock. Clean impurities out of the metal surface you plan to weld. Impurities and contaminants in the metal can affect the quality of the weld. Be careful not to weld with the wrong current. The type of metal you use and the electrode will determine the current you use, and how much: either AC or DC. Before you weld, cut off a few scraps of the metal you plan to use and test your settings on those practice pieces to be sure you have selected the correct current level. Here’s our recommendations for the best TIG welders currently on the market. The 2016 AHP Alpha TIG welder is a pretty powerful welder. It has a reliable, long-lasting IGBT technology with pulse technology that can perform at both 110V and 220V inputs. Suitable for beginning and intermediate users, it features a full range of pulse features and cleaning control for AC. It’s capable of welding ¼ inch aluminum, 3/8 inch mild steel. Simple set up and operation, it comes with a WP17 flex hose torch and foot pedal for great TIG weld control and operation. While this is a pretty easy to use welder with pretty good arc stability, it does have some drawbacks. The display only shows the starting amperes until you switch it to T2 mode. Additionally, the foot pedal has a tendency to slide on the floor and might require the addition of rubber feet. The manufacturer offers a 3-year warranty on the machine and 6 months on the accessories. Overall, this is a great TIG welder at an affordable price. The Everlast PowerArc welder is a small, portable dual voltage welder. It can be operated at 120V and 240V and is powered by a small IGBT inverter device that gives arc stability that is comparable to more higher-end machines. At just 24 lbs., you can put this welding machine anywhere you need to weld such as farm, home, or hobby shop. This machine comes ready to weld with a nice carry case at an affordable price. The Everlast PowerArc Welder it is not suitable for industrial use. While this machine is relatively stable for it’s size, some welders might find the electrode cable to be too short. Good things do come in small packages and the Everlast PowerArc 140 Welder is no exception. For the beginning TIG welder, this machine is ideal. The Forney 324 190 AMP welder is a 3-in-1 multi process inverter machine, which is capable of doing MIG, Stick or TIG welding. At 43 lbs., the Forney 324 is portable. This unit is so simple to operate and little to no setup is required - it’s ready to weld straight out of the box. It comes with an adaptable plug so it can be used with either 230V or 120V input power. The torch has a 10’ lead and features a built-in strain relief which extends the cable life. It features a Euro style disconnect and is Tweeco compatible. Like most multi-welders, the Forney 324 runs on DC current so it is not suitable for MIG welding aluminum. Additionally, on occasion, the wire feeder has been known to stick. The Forney 324 is a nice, quality all in one unit with a lot of versatility that even a beginner welder will be happy owning. No one wants to get stuck without a stable and mobile stand for their carts, so we’ve compiled some reviews of the best welding carts, as well. The Xtreme Power Welding cart is a heavy-duty welding cart, made of durable cast iron steel with 3 shelves for easy access to supplies and equipment. The tilted top shelf provides for easy access to the controls on the welder. The cart also features two safety chains for securing shielded gas tanks. It has heavy mounted caster fixed wheels in the back and swivel wheels in the front and an easy to pull handle making this cart very maneuverable. The best feature though is the price. While it’s a great machine for the price, it is a little complicated to put together as the directions are not well written and the holes do not always line up so installing shelves can be tricky. Although it may take some effort to assemble, it does make for a nice welding cart. The Chicago Pneumatic Welding Cart is a sturdy steel-constructed cart with two shelves in addition to the tilted top shelf to securely store accessories. The cart features a hook for holding the torch assembly and two safety chains to secure 2Famznthe gas tank. It’s easy to put together and portable at 31 lbs. 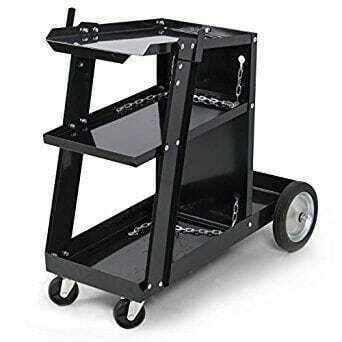 While this a good, sturdy cart, it is a little on the small side and won’t hold multiple welders. This model from Chicago Pneumatic is stable, and reasonably affordable. It’s a decent choice overall. The Arksen Universal welding cart is solidly constructed of steel with a nice satin black finish. It features 3 shelves, with the top shelf tilted slightly to allow the welder to easily reach the machine controls. Lead hooks on both sides provide places to manage cables and two safety chains can hold gas tanks securely in place. Easy maneuvering at 22 lbs. While this cart is affordable, some users have had difficulty assembling the cart due to poor instructions. Additionally, the cart is quite small and may not hold all types of welding machines. Although there are two safety chains, only one gas tank will fit in the cart securely. The Arksen Universal Welding cart is the highest priced option reviewed here, and you’ll want to check carefully to make sure it suits your needs. For those individuals interested in learning to TIG weld, there are a number of good resources. Some local welding supply houses run classes on the weekend for hobbyists. Step by step video learning is a popular resource as well. Either the one earlier in the article or this one below are great alternatives to start with. TIG Welding is a sought-after process of welding and is growing in importance in industrial welding. While it requires more time, practice and preparation than any other welding method, it is not an extremely difficult process to learn. It just require the use of some complex equipment and takes practice to master the different TIG welding positions. By utilizing a variety of sources of TIG welding training resources and with practice, you can become a skilled TIG welder.